Shizuoka University and collaborating Central-Eastern European universities are involved in the active exchange of research, students and doctoral courses to improve academic progress and achievement in engineering. The IA Community is a general term that describes the community comprised of the universities, faculty members, students and clerical staff work with IA. The international conference called Inter-Academia is the keystone of the IA program. The Inter-Academia conference has taken place every year since 2002. 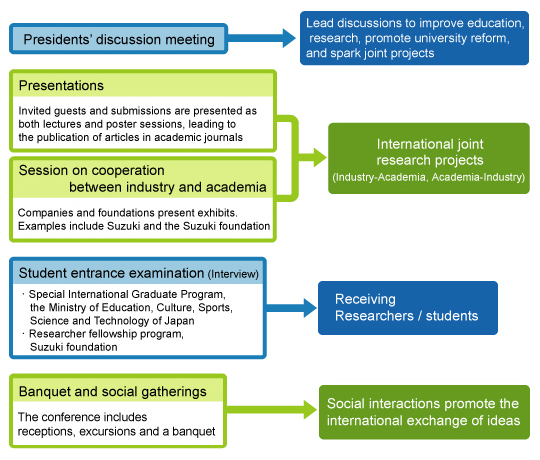 IA activities are typically carried out by the faculty of Shizuoka University and it’s sister universities, but IA welcomes a wide range of participants from other research institutions and industries to promote the exchange of knowledge by providing a forum for exchanging novel research results and opinions. The IA Community welcomes the participation of new members in this conference. Under the leadership of Shizuoka University and according to the slogan: “Development of Global Brain network,” an Inter-Academia conference has been held every September since 2002. In each case, one of Shizuoka University’s Central and Eastern Europe partner universities has organized the conference. Inter-Academia is an established international conference that promotes the academic and social interactions of researchers from academia and industry. Conference activities include the presentation of research papers by students and faculty members, a visit to the facilities of the organizing university, exhibits by cooperating companies, discussions aimed at improving educational and research programs and even social excursions. The Double degree programme for PhD (DDP) emerged from discussions at the Inter-Academia conference and led Shizuoka University and the Warsaw University of Technology to enter into an agreement to participate in the DDP. At the time of 2012, 3 other universities from Inter-Academia community, Alexandru Loan Cuza University, Gomel State University and Sofia University are included in the DDP. The first Inter-Academia conference, in 2002, involved four partner universities. The 2006 Inter-Academia conference at AIC University in Romania included six partner universities with around 120 participants. And at the 2007 Inter-Academia conference at Shizuoka University in Japan, we invited some researchers from Asian sister universities and the total participants was 195. By 2012, Inter-Academia expanded to the community of 11 membership universities, the conference in summer at Obuda University, Budapest, Hungry, had about 90 participants.